While some say that cyberpunk is a dead genre, the authors and artists behind Foreshadows: the Ghosts of Zero would disagree having gathered 19 stories of a cyberpunk future, each with its own musical track and illustration. The world portrayed in the stories is not a happy one, dominated by mega-corporations, scarred by war and economic upheavals and racked by future shock. Overall, the authors do a good job building ties to the background and including threads from other stories so that you can see that they all take place in the same world. As with any anthology, it is a mixture of styles and voices many of which are from the gaming fiction side of things (Keith Baker, Ed Greenwood, Ari Marmel) and all of whom seem comfortable writing the broad cyberpunk genre. As mentioned, each story is illustrated (ably by Talon Dunning) and given its own musical score (some samples of which can be heard here) which adds an interesting framework to the stories. I found Foreshadows a very good read with an interesting blend of voices and viewpoints, though there were a couple of stories that failed to really come together, I would certainly read more set in this world. If you read the cyberpunk genre, you should enjoy this collection. Part of the purchase price of Foreshadows goes to aid the Hunger Project. Disclosure: The Very Us Artists provide me with a review copy of Foreshadows after meeting with them at GenCon. Some of you may recall that I reviewed the Steam-Powered Lesbian Steampunk Anthology last year. This year, there will be a second volume which I will not be review as I am one of the authors! This is my first non-gaming related fiction publication so I am very proud of it. Update 2: There is a mini-interview about my story up at the Steampunk News. 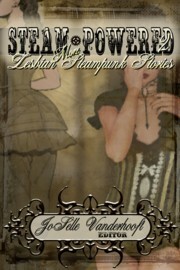 Steam•Powered: Lesbian Steampunk Stories, an anthology edited by JoSelle Vanderhooft and published by Top Shelf, an imprint of Torquere Press Publishers. This anthology consists of fifteen stories mixing lesbians and steampunk in various concentrations. For me, steampunk is mixing the untapped potential of the new sciences and technologies of the industrial age through the 1920s to the punk ethos from cyberpunk, in other words how the new technology changes and oppresses the world. By my definition, three of the stories do not fit into the steampunk genre but they are still quite interesting all the same.